The proposed two-story, 4,100 square-foot new building would be on a vacant, 1.3-acre lot that was donated to the food bank by local resident Norman Pomerleau. 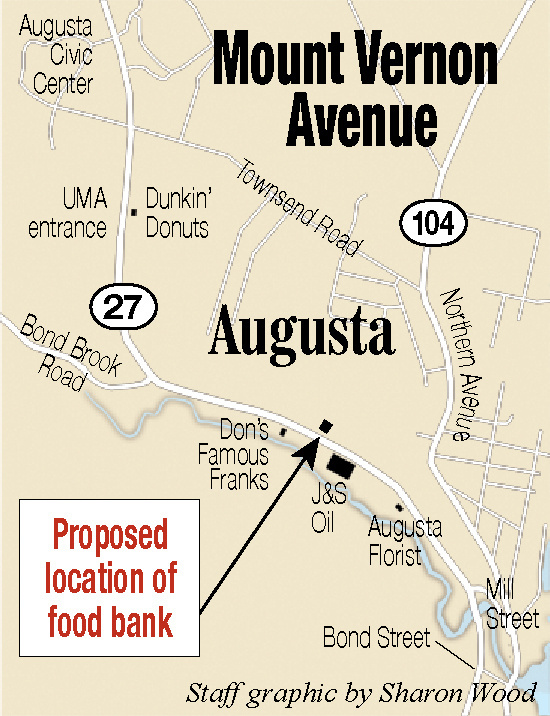 AUGUSTA — The Augusta Food Bank plans to build a new facility and move to Mount Vernon Avenue. Plans to build a new home for the food bank, which provides food to Augusta and Manchester residents in need, go to the Augusta Planning Board for review Tuesday. The proposed new building, unlike the food bank’s current facilities, would include space for both food to be stored and distributed at a single location, increasing efficiency. Currently, the food bank is located in St. Mark’s Church’s parish hall on Summer Street where it has a distribution center, but there is limited storage space in the portion of the building it rents there. Much of the food it gives out, before it is ready for distribution, is stored in a warehouse off Bangor Street. St. Mark’s parish hall, which is also home to a clothing bank, warming center and an essential items pantry, is for sale. “The immediate (reason for moving) is St. Mark’s being for sale, and no longer available to us,” said Daniel Wathen, president of the food bank’s board of directors. “But more importantly, we really need to have the warehouse and distribution facility in one location, and in a permanent location, to make it more efficient. We’ve been operating with a warehouse on one side of the Kennebec River and a distribution center on the other side, so a lot of volunteer and staff time is consumed each day,” going back and forth between the two. The proposed two-story, 4,100 square-foot new building would be built on a vacant, 1.3-acre lot at 161 Mount Vernon Ave. that was donated to the food bank by local resident Norman Pomerleau. If the Planning Board approves of the proposal, Wathen said they plan to start construction around June 1, with construction expected to take three to four months. Wathen, a former chief justice of the Maine Supreme Judicial Court, said the building is likely to cost about $675,000. Food bank leaders are planning a fundraising drive, with a capital campaign expected to enter its public phase June 1, to pay for the new facility. They’ve secured a temporary loan from the Genesis Fund to pay for the initial construction costs. Both the current St. Mark’s location and planned new Mount Vernon Avenue location are near residential areas of the city. Wathen said in recent years food bank officials informally surveyed clients to ask if there was an area of the city they would find it hard to get to, if the food bank were to move. He said most responded that as long as it moved to elsewhere within the city limits, they could still get there to pick up food. “We do have people who walk to the food center, but whether you walk or ride, the Mount Vernon Avenue location is not that far from our present location,” Wathen said. The new spot will have parking for 22 vehicles, and a waiting room with seating for 26 people. It will also have a loading dock and room for tractor-trailers to make deliveries of food. The food bank is currently open from 12:30 to 2 p.m. Monday through Thursday and from 5:30 to 7 p.m. on Mondays. The Augusta Planning Board is scheduled to hold a public hearing, and conduct a minor development review, on the food bank’s plans at its 7 p.m. meeting Tuesday in council chambers at Augusta City Center. Board members are also scheduled to conduct a minor development review of a MaineGeneral Medical Center proposal to build an 11-space parking lot serving an existing medical office building at 21 Middle St. and 23 East Chestnut St. The food bank was established in 1981 and now serves an average of 350 households a month, according to its website. Residents of Augusta or Manchester may apply for an order of groceries once every 28 to 30 days.